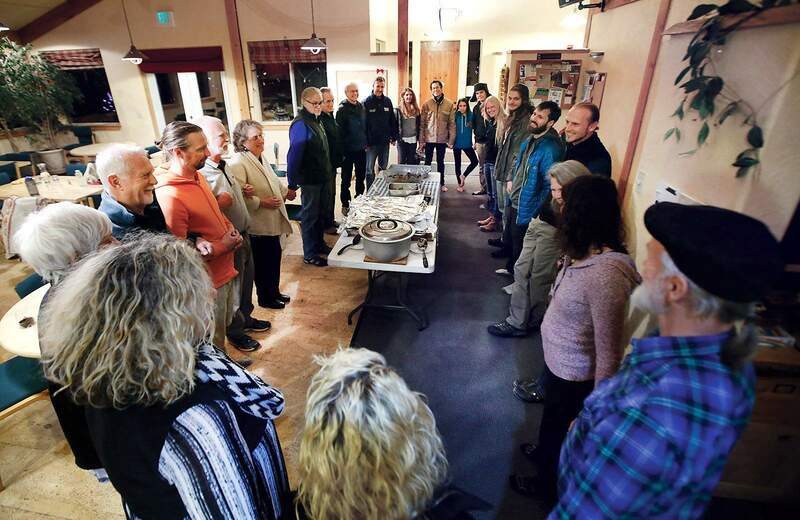 Residents of Heartwood Cohousing gather in a circle before a community dinner in December. Heartwood residents plan regular dinners, community work days and other events to encourage relationship building. 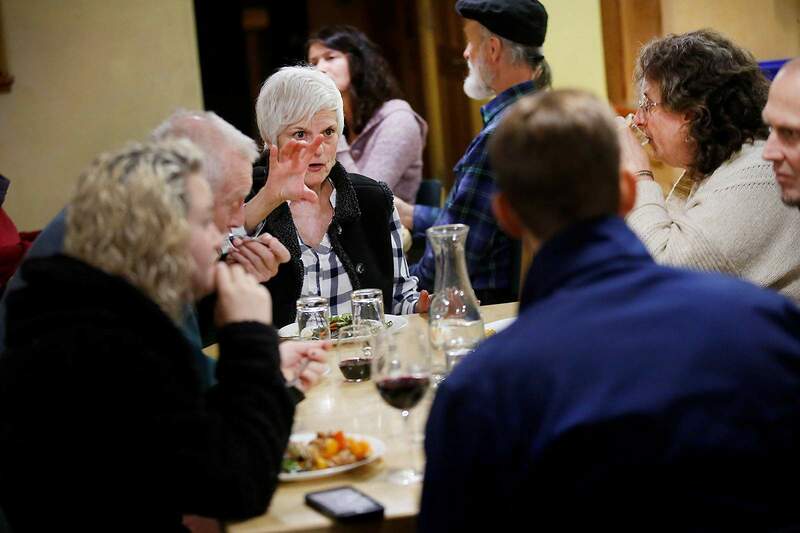 Sarah Gordon talks to fellow residents during a community dinner at Heartwood Cohousing. Zakoree Harrison carries in food for a community dinner at Heartwood Cohousing. Becky Logan moved into Heartwood Cohousing near Bayfield in November because she was looking for a community after years of traveling in an RV. She was drawn to cohousing by the tight-knit relationships the living arrangement fosters. It would have taken her years of building relationships through a church and other social activities to establish the same sense of community that is a natural part of living in Heartwood. In the Bayfield cohousing community, homes are owned privately, but residents collectively own and manage a greenhouse, woodshop, community building, land and other shared assets. The residents also plan community meals, work days and other events geared toward building relationships. “There are events and activities that I can immediately be part of. I just love it,” Logan said. Even the layout of the small neighborhood, built on 361 acres, was designed with relationships in mind. The 24 Heartwood homes are built close together facing a central pedestrian pathway, said resident Mac Thomson. 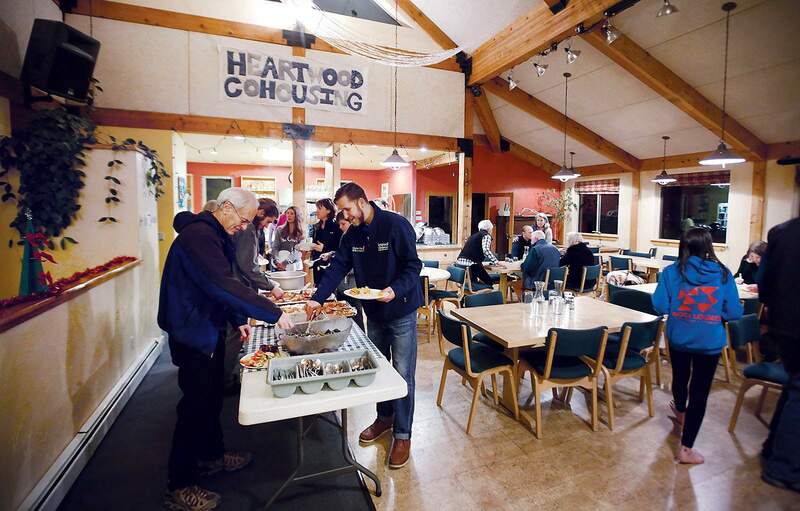 Residents of Heartwood Cohousing gather for the community dinner. The community near Bayfield is planning an expansion. Heartwood, built on 361 acres, is expecting to add between 10 to 15 new homes. More new residents will have an opportunity to move into Heartwood in a few years because the community is planning to build between 10 and 15 new homes, said Thomson, the project manager. Heartwood is in the early stages of working with La Plata County to get approval for the project, he said. The community originally planned for an expansion shortly after the first phase was completed in 2000. The additional homes were planned to financially support the development, he said. But Heartwood residents could not afford improvements to the U.S. Highway 160-County Road 506 intersection that the Colorado Department of Transportation was going to require before new homes could go up. 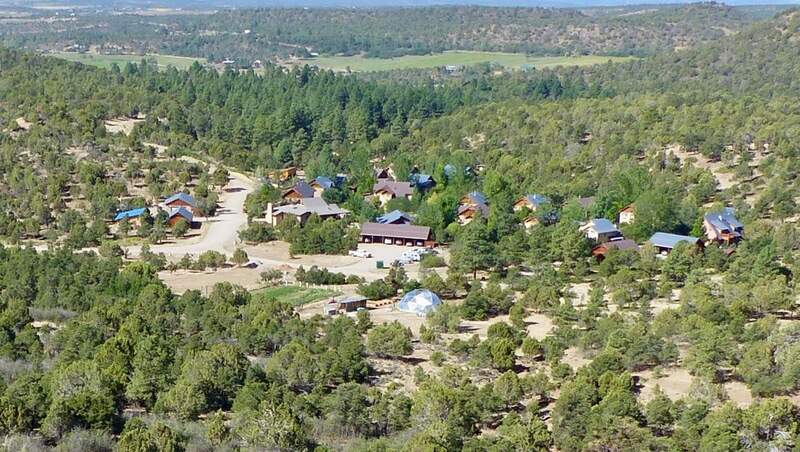 CDOT was going to require Heartwood residents to widen U.S. Highway 160 to accommodate a new turn lane to access County Road 506, which leads to the cohousing community. The project can now move forward because Heartwood paid an engineer to design a new turn lane that took the place of a substandard passing lane. The new lanes were striped when the highway was recently resurfaced, Thomson said. Now, the community is ready for expansion, and Thomson expects residents will likely commit to moving into new Heartwood homes before they are built, as prospective residents did ahead of the first phase. In its early years, in the 1990s, Heartwood drew residents from all across the country, including Thomson. Heartwood Cohousing, a development near Bayfield, is in the early stages of planning an expansion. Heartwood homes are built on 361 acres and clustered together to encourage interaction among residents. Thomson was inspired to live in a closely-knit community after traveling internationally with his wife. “We found incredibly rich community life in all these traditional villages and rural settings. ... And thought, ‘We want that in our life when we go back home, settle down and have a family,” he said. After reading a book about cohousing, which was first developed in Denmark, they decided it would be a good fit for them, in part because it preserved homeownership and financial independence. They moved from Minnesota to join the fledging group founding Heartwood. Michael Walker, also a founding resident, describes cohousing as a “sane, but uncommon” model of living. In many subdivisions, residents find it tough to approach each other about problems, such as a barking dog, because they don’t have relationships, he said. “It’s not the geography of the houses. It’s the geographies of the psyches. In a standard neighborhood, the problems you run into are problems of distance, not because the houses are so far apart, but because the people are so far apart, the minds are so far apart,” he said. 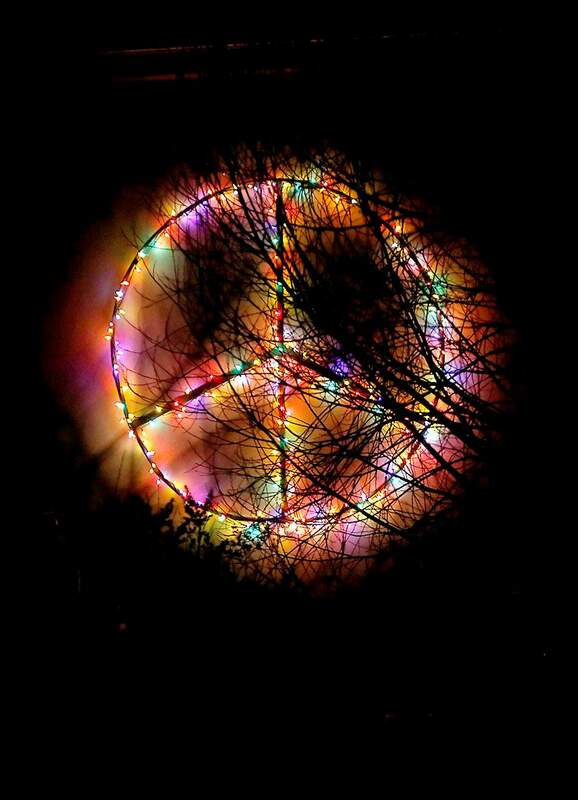 A peace sign made of Christmas lights glows at Heartwood Cohousing. Residents of cohousing developments tend to share similar vision and values. Residents at Heartwood have conflicts, but the community encourages them to talk with each other to resolve issues. The community has also set up a group to help with conflict resolution, resident Sondra Joyce said. Running Heartwood is a group effort, and residents work in volunteer teams to manage Heartwood’s land, water, parking, fire mitigation, greenhouse and gardens and other aspects of the community, Thomson said. To financially maintain the community, residents pay between $200 to $300 a month based on the size of the household, he said. 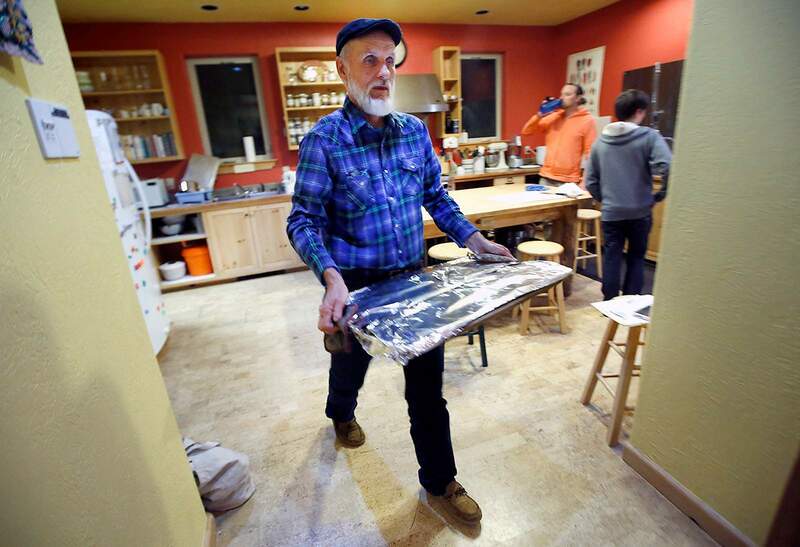 Financially, living in cohousing is on par with living in a traditional neighborhood, Thomson said. Perhaps counterintuitively, cohousing tends to attract introverts because it makes socializing easier. If residents want to spend time with their neighbors, they can go out on their front porches, and that’s an invitation to others to stop over, Walker said. They can also attend events, including the three community dinners planned each week. “There is an ease of being together, when it’s the right thing for you,” Joyce said. Private homes clustered around shared space are the basics of a cohousing development, according to the Cohousing Association of the United States. Cohousing neighborhoods are also built on shared vision, values and participatory decision making. The legal structures of a cohousing development can vary. Homeowners associations, condominium associations and housing cooperatives are some of the common legal structures in cohousing, according to the Cohousing Association. Heartwood is set up as a homeowners association.